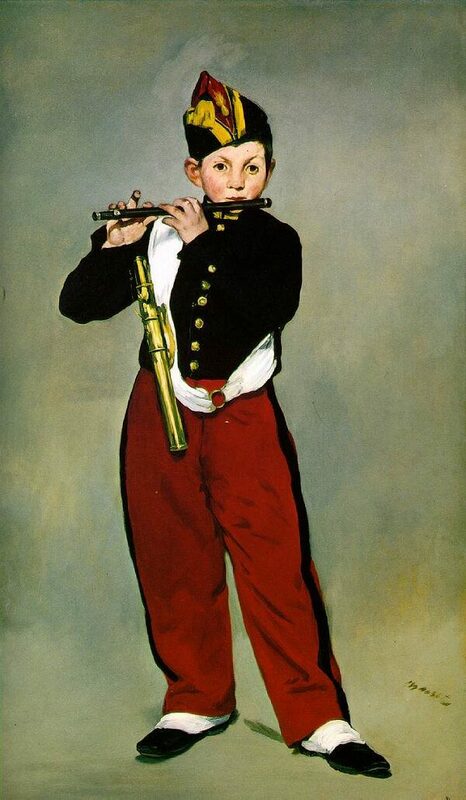 The Fifer was painted by Édouard Manet in 1866. 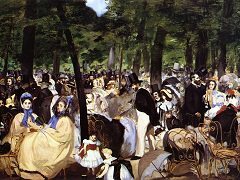 Manet painted in both the Realist and Impressionistic style, and like many innovative artists, was not well-appreciated in his own time. 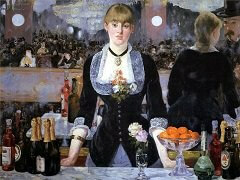 The painting grew in popularity in the 20th century, moving from private collections to the Musee du Jeu de Paume and finally to the Musee d'Orsay, where it is currently displayed. The 63 inch by 38 inch oil on canvas painting shows a single figure against a stark background. 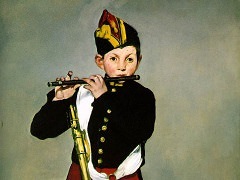 A young boy dressed in a military uniform of red pants, dark jacket with brass buttons, a white sash, and a dark hat with a red cockade, plays a fife (flute). The flute is dark wood with silver fittings, and a brass carrying case for the instrument rests at his right side. The figure is fully illuminated from the front with only a hint of shadow behind him, giving the painting a curious, almost photographic flatness. 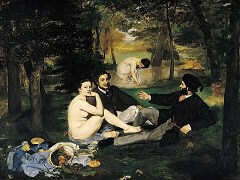 Manet was deeply interested in the painting techniques of the Spanish school. 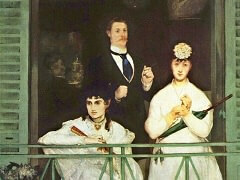 In 1865, he traveled to Spain to study the works of Diego Velazquez and other Spanish Renaissance masters. All of his work would show the influence of this study, but none so starkly as The Fifer. 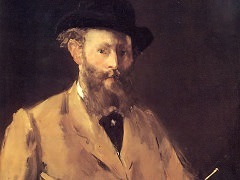 Manet dispensed entirely with Renaissance Chiaroscuro for The Fifer, choosing instead to flood his subject with the most direct light and flatten the scene. Dark outlining further flattens the subject, and the pose, taken from French Tarot, adds to the cartoon-like quality of the piece. The Fifer, while now recognized as one of the first Early Modern pieces, was totally shocking to its contemporary audience. 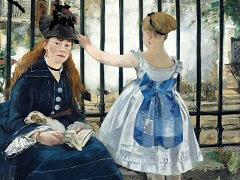 The great art critic Emile Zola defended it in vain as an expression of artistic innovation and freedom. It would take several decades before anyone agreed with Zola's analysis.